Every business has processes whether you realize it or not. Now, you should realize it because in your business you should have your system documented. But, don’t you worry. We can come back to that at a later date. We teach the processes of the marketing system. However, if you systemize things in your business, you should systemize everything. Once you get into that habit, you will have a very efficient business, a business that can run without you being there. How cool is that? How do you think I sneak off to Canada for half of the year? Why do you think I never seem to go to this workplace, my Fire Safety workplace that I keep talking about? Why am I at home? It’s because we’ve got systems and I have smart people to implement the systems. Let’s take my business as an example. We’re a pretty ordinary business. We sell fire extinguishers, smoke arms, safety signs, all that malarkey. We have a warehouse in Canterbury, in Kent, in the UK and I have a lot of employees. Don’t ask me how many because I can never remember and I get it wrong. But, something like a dozen maybe. Should I know that? I’ll count them up tomorrow, next time I see them. Now, we have basically finance processes, marketing processes, warehouse processes, and customer service processes. That’s it. Marketing, pretty simple, as you know, as I have mentioned, is just, well it’s actually just two people and the other person who is training, who has just started is on holiday for 2 weeks at the moment. So, just one person. There are no sales people. There is a process for e-mail, processes for e-mail marketing, and other stuff? We do some direct mail stuff, paper clerk, some content development, oh yeah, and of course, content marketing. I knew we did something. In the warehouse, there is stock control, purchasing, packing, dispatch systems, quality control, customer services, delivery problems, answering the phone, order inquiries, processing orders, finance, bookkeeping, etc, there are processes in everything. And, a lot of those basic things will apply to any business. If you are a restaurant, you’re going to have a process for welcoming or greeting guests, for taking their order, for delivering their order, for tidying up, for food prep, for cooking, cleaning up, menu changes — you know, processes for all these things. Anyway, it’s Friday. Friday is when we have the weekend challenge, because it gives you something to do. By the way, our weekend challenges will be written upon to one massive page which is going live soon. We will let you know as soon as it is live. 1. Select five of your best processes (remember we talked about the 80-20 rule and working on things that you’re good at). 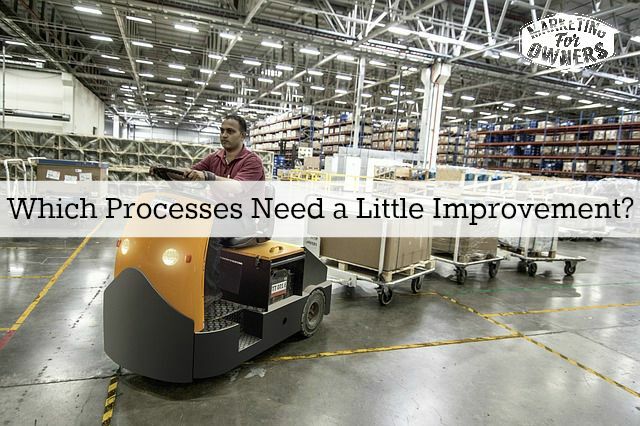 So, let’s start with five processes that are real needle movers, that if you made them better, they will have a real difference on the bottom line or on the progress of your business. 2. Now,for each of the five process you wrote down, I want you write down three things that are great about the system, three results they get, and three ways they make your life better. 3. Then, I want you to write down three things that are not so great. and three things that are bad about the system, etc. So you will write down three things for each of those things listed for 2 and 3. 4. Now, you are going to pick five of the bad things that you wrote down that need lots of improvement . Out of the 15 you just wrote down you are only going to pick just 5 and write them down. These are the ones that you’re going to aim to improve first. Don’t worry. You’ll get to the others. In actual fact, some of the others might get improved at the same time as a knock on effect. I’m sure the benefits will be seen in a couple of weeks. 5. Now, the final step, remember we talked about working on your strengths, and not weaknesses. 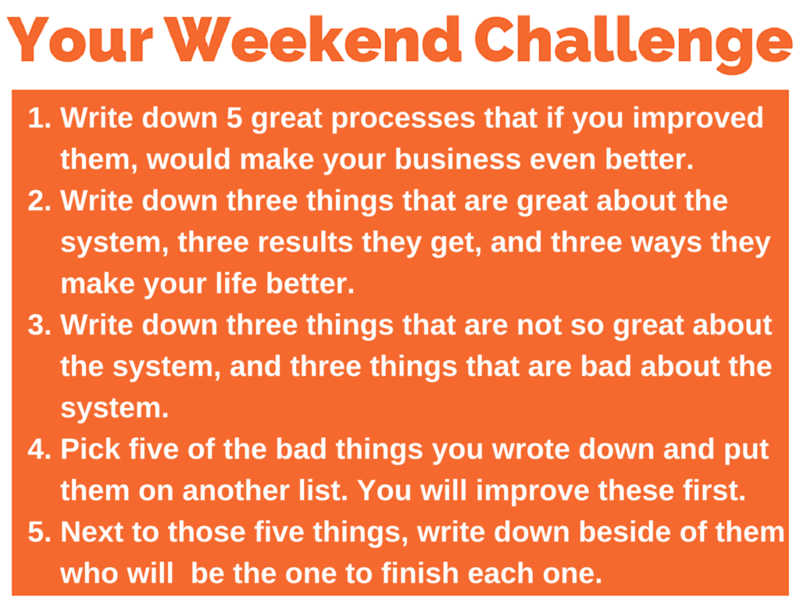 You are getting ready to implement that into this challenge because, I want you to write down next to those 5 things you just listed, who will be completing each one. Some will be your name and those are things that you are good at. But, the things you are not so good at or the things you don’t like doing, which is quite often in my case, then put somebody else’s name next to it. And, that’s it. That’s your challenge. You now have five things to do, five things to work on to improve, things that are already working okay but just can be improved, slight improvements, 1% compound effect. And, that’s what you are going to start on next week. Give yourself a deadline of 7 days to get these things done. If they take longer, give it a bit longer. But, 7 days is what we’re aiming for. Write it in your calendar. Make sure you’re going to monitor it. Tell somebody else, “These need to be checked on that date.” Schedule it. Get it done. Have yourself a good weekend. Enjoy your time off. Don’t work or don’t work much. Spend some time with your family. Go out. Visit a museum, go to a movie, go walk by the sea, go walk in the woods, in the countryside, in a forest. Get away from work. Have some much needed free time. I’ll catch you soon.